The 6 color flexographic printing machine with three die cutting station is suitable for the printing of coated paper stickers, aluminum foil stickers, thermal paper, as well as PE, PP and PVC stickers. The resolution is more than 150LPI. 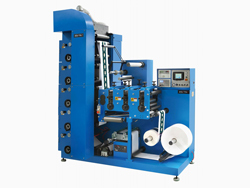 This equipment can complete unwinding, printing, varnishing, laminating, die cutting, exhausting and winding. Due to its high quality and low price, our product has enjoyed a good reputation since its first launch eight years ago. The export volume remains at 10 sets per month. 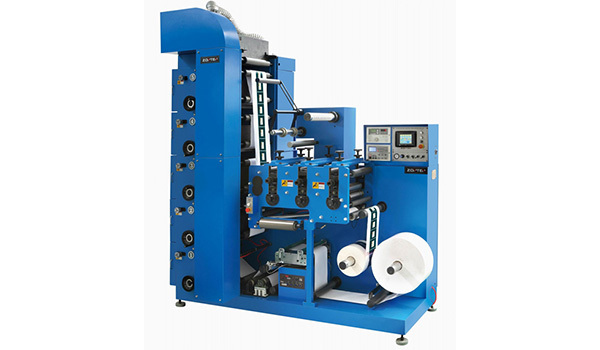 With wide applications, fast printing speed, high economic benefits, non-pollution and other characteristics, it is the ideal equipment for various printing houses to print bills, card paper, and top grade sticker labels. Note: Appearance and process are subject to change without notice. The main motor adopts a frequency conversion stepless speed control device imported from Japan. The device can reduce mechanical shock and power consumption, so the life of the machine is extended and the cost is reduced. More stable and reliable unwinding and winding are ensured by the magnetic powder brake and clutch. Customers can also use Japanese Mitsubishi auto tension controller. Our product employs the anilox roll which has abrasion resistance, corrosion resistance and a long lifespan. 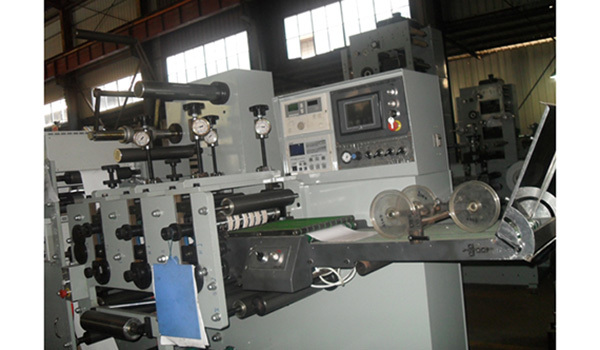 This is favorable for reducing the times to replace the roll and for improving printing efficiency. When printing finishes, the roll can automatically separate itself from the printed products and keep a low-speed rotation to prevent the drying of the ink on the roll surface. The printing units adopt 360° circular register regulation. 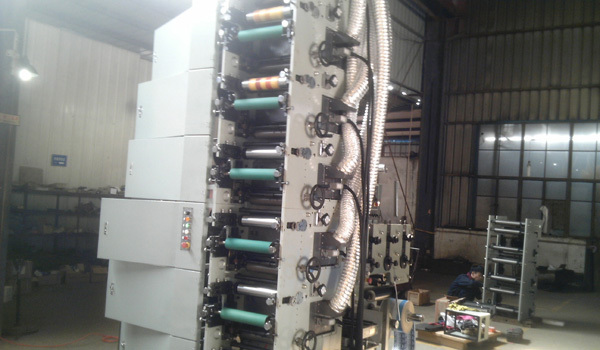 Each printing unit, responsible for the printing of one color, can be detached and used independently. It is equipped with a set of infrared drying device. The device enables the ink to condense quickly, avoiding ink blurring, shedding and other phenomena. Customers can also choose to install an ultraviolet drying device. They can specify the color of the equipment as well. The LRY-330/450 flexographic printing machine stacks multiple printing units to realize the printing with two to six colors. The printed products have stable color and can be die cut directly. 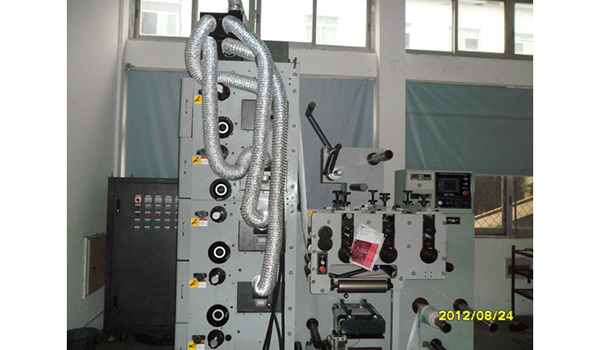 The die cutting machine adopts three die cutting stations with support rollers. Combined die cutting can be achieved and the cutting is accurate. With the printing speed of 10 to 80 meters per minute, this equipment can print on materials with the thickness of 0.1 to 0.3 mm. The LRY330 and LRY450 can print for materials with the maximum width of 330mm and 450mm respectively. Customers can choose the appropriate product according to the actual printing needs. As a China-based 6 color Flexographic printing machine with three die cutting station manufacturer, our company also supplies stacked Flexographic printing machine, automatic label inspecting machine, 8-color intermittent letterpress high speed label printing machine, and more.